Announcing another Stage 1 digital story based on the Book Week 2012 slogan. As mentioned a few weeks ago, I’m spending two weeks with each class group (about twelve selected students), identified by each class teacher, for 30 mins per day. In this particular example, the teacher wanted every student in her class to have the experience, so Year 1 students of a composite class started a story (theme, character building, some photos) and the Year 2 students finished it (more photos, sequencing, caption writing, editing, etc). Remember that Photo Peach requires the latest version of Flash to view the digital story. Please remember that Photo Peach is blocked for student use by the NSW DEC’s web filters. For good reason. It has some very unsavoury stuff on it. Similar to Youtube, no one rates the material. Search “What’s popular” or “What’s new” on the site and you’ll find lots of other… inappropriate stuff. Just like Youtube and other Web 2.0 tools, such as wikis and blogs. Every time I’ve used the Photo Peach site, it’s under MY username and (secret) password. We work on brainstorming and storyboarding offline, then upload photos or graphics under my direct supervision, edit in small groups, and view our finished products the same way. My username and password, and no one else can change it. No open browsing. Unless you close off open comments, these, too, have to be previewed before each use with students if you notice a new comment has been added. I’ve written several articles about strategies for use. Click HERE to download a PDF from Scan teacher librarians’ journal (NSW DEC). or other articles ‘iInquire… iLearn… iCreate… iShare: Stage 1 students create digital stories’ in Scan 30(2) May 2011, pp 4-5.
or a similar idea using PowerPoint instead: ‘Have blog, will storyboard!’ in info@aslansw Issue #2, May 2010, pp 5-8. Recent NSW DEC book raps have excellent online instructions for using Web 2.0 tools with students. Scroll down on the PDF linked HERE. While there is some inconvenience with using Photo Peach, it’s still an amazing resource and the benefits outweigh the problems. Small group work enhances opportunities for talking & listening, negotiating and other skills. If you’ve never used this website with students, please have a go when next studying endangered animals or persuasive texts. 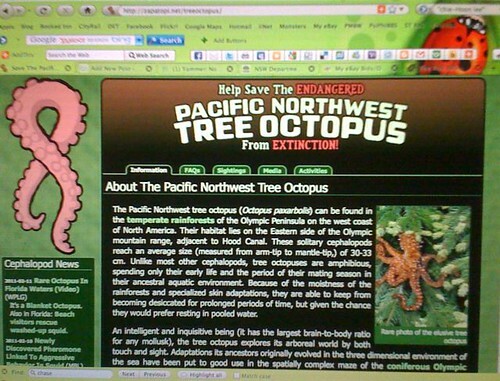 I had a great science and technology lesson about The Endangered Pacific Northwest Tree Octopus with Stage 3 today. In preceding weeks, the students had already viewed selected Youtube video clips of rainforest animals, “The Dodo” episode of the TV program “Extinct”, and an array of fiction and non fiction books about endangered animals. We had already discussed concepts such as authority, reliability and publishing dates of the books and clips. Today, in groups, they were asked to explore the Tree Octopus site, reporting on ways the web composer had used persuasive images, design features and text. For a disturbingly long time, no one questioned the factual content, authority or reliability of the site. It took some students a full 45 minutes to realise they were being fooled by a bogus website. A few remained confident right to the end. Some great dialogue ensued and I know this will be a memorable, cautionary experience which will support their ongoing research in the weeks to come!